4 bedrooms, 2 baths, sleeps 8, washer/dryer, furnished, 2 floors. New England harbor view sunsets! This house is furnished and decorated with leather couch, big screen TV with surround sound and stereo speakers throughout the house, beach accessories, maple floors and wainscot benches. Large deck with gas grill and top of the line Thermo Spa hot tub! Open floor plan layout cathedral ceiling living room with windows overlooking the harbor! Sleeps 8 with 4 bedrooms and 2 baths, this house is perfect for a beach week getaway. 1 bedroom with private bath. the lower level has 3 bedrooms with one bath and laundry. There is also an enclosed outside shower to rinse off after a day at the beach (could even shower in there if needed). Summer days you'll enjoy a short walk to the beach. An abundantly equipped kitchen with large glass table and breakfast bar seating will accommodate 9 people and finish off a perfect beach day. We prefer to do weekly rentals but are willing to rent weekday/weekend nights last minute. We require a 2 night weekend and 3 night weekday minimum but are willing to lower the rates if you should stay more nights. Note that the long weekend/nightly options are only last minute (so if the unit has not rented by the week before). We are also flexible on check in/out times on long weekends if no one has rented the weeks before/after yours. Nightly has the strict check in/out times. We REDUCE WEEKLY RATES by 20% two Mondays prior to Saturday check-in. Please see rate tab for more details. Please c all Leeanne at Beachside Bookkeeping, 282 Portsmouth Ave, Seabrook, NH anytime to view the property. 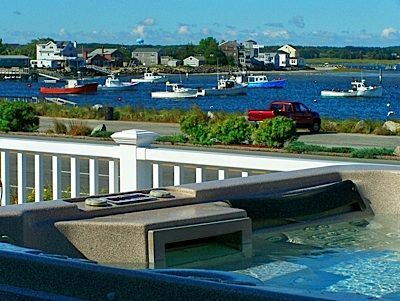 Located in Seabrook Beach, NH. You and your guests can take a walk to Hampton Beach or a short drive to Newburyport, MA or Portsmouth, NH to enjoy restaurant, shopping and nightlife. Local jet ski rental, amphibious bus tours, deep sea or party boat fishing, casino water slide, concerts and entertainment at the Hampton Beach Casino Ballroom, whale watching and much more. Visit http://www.hamptonbeach.org/annual-events.cfm for a more detailed list events. Outdoor shower for rinsing off after day at the beach. Enjoy relaxing in the hot tub. We really enjoyed our stay! The living areas were very roomy and comfortable and the bedrooms were as well. Everything was very clean and Leeanne was a super host- helpful and accommodating. The windows provide nice views and a lot of light. The beautiful beach is a short walk from the house. This is a fantastic rental. The house is spacious and very clean. The location is great. We will definitely rent here again. Cassandra - we hope to have you back. Thank you for the wonderful review. The house is very nice and up to date. The upstairs is open concept and the side facing the water has large windows with great views. The house is very comfortable and the home owner is very easy to work with. The house comes with everything you need to just show up and relax and enjoy yourself. The house is located in an easy to get to spot and actuall has decent parking. Large outdoor deck with a grill and hottub over looking the water. There is a small beach accross the street within easy walking distance. Will definitely be renting the house again. Thank you Matt and hope to have you back again soon. We were 8 adults staying in the winter for a long weekend. There was plenty of room, beds were comfortable, clean, owner very nice, great view of sunset and short walk to beach. TV's in each room. Had a wonderful time! Cant wait for next year! Wish you had better weather but glad you were able to enjoy your weekend. King size bed was tremendously comfortable and the hot tub was excellent. We enjoyed it completely! New England Beach Community! Short walk to beautiful beaches. Enjoy summer in a luxurious beach home. Located in the Seabrook beach area. You and your guests can take a walk to Hampton beach or a short drive to Newburyport MA or Portsmouth NH and enjoy restaurant, shopping, and nightlife. Local jet ski rental, amphibious bus tours, deep sea or party boat fishing, casino water slide, concerts and entertainment at the Hampton Beach Casino Ballroom/Salisbury Blue Ocean Music Hall, whale watching, surf lessons and much more. Only a few hundred feet from bridge to Hampton Beach. Located on Seabrook Beach. Other Activities: Shopping, music shows, restaurants, night life, arcades, water slide, surf lessons, jet ski rental, canoeing, body boarding - beautiful AM walks to see the sunrise - fun beach hunting for sea shells, starfish and sand dollars...if you have kite boarding gear they go in the bay when the wind is right! Golf: Short drive to golf courses within 10 miles, mini golf available 2 locations 1- 5 miles. $400/night with a two night minimum plus tax and security deposit. OFFSEASON - RENTED AS A 3 BEDROOM OCT-MAY Weeks or long weekends for $1000 plus tax and $500 security deposit.